Police and emergency at metro Sennaya, which was cordoned off because of suspicious object. St. Petersburg, April 4 , 2017. The death toll from a bomb blast on a metro train in St. Petersburg on April 3 now totals 14. Security measures in Moscow and St. Petersburg have been beefed up, and authorities are investigating two possibilities - it was either the work of a suicide bomber, or terrorists inadvertently left the explosive device in a train car. A man from Central Asia is the main suspect. On the morning of April 4, Russian Health Minister Veronika Skvortsova gave the latest figures for the number of dead and injured in the terrorist attack in the St. Petersburg metro. The death toll now stands at 14 – of this number, 11 people died at the scene, and another three later succumbed to their injuries. As of this morning, about 50 people injured in the attack remain in the hospital. 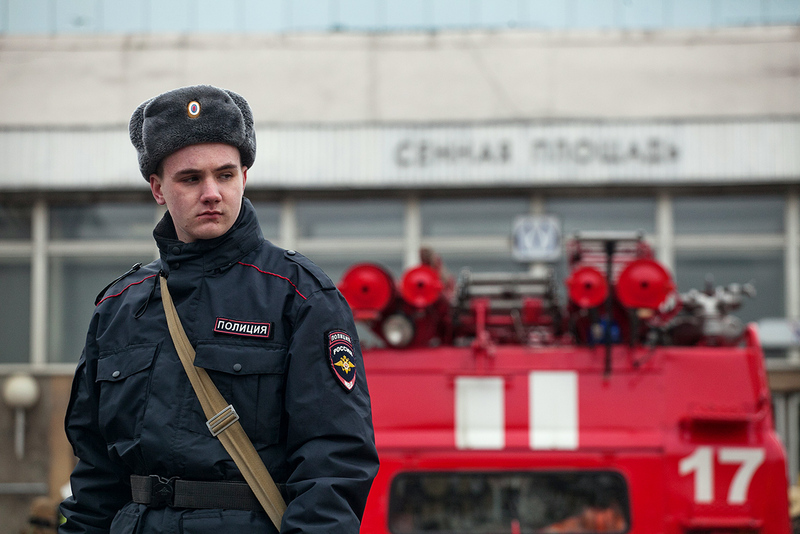 The Emergencies Ministry office in St. Petersburg published a list of the injured. The following is known for sure: the explosion happened in a train car in the tunnel between the Sennaya Ploshchad and Tekhnologichesky Institut stations at about 2:40 p.m. local time on April 3. The train driver, Alexander Kaverin, followed instructions and didn't stop between stations and drove to the next platform, which helped save lives because in an enclosed space the number of victims would have been higher, said the St. Petersburg Metro's press office. A second bomb, found at the Ploshchad Vosstaniya station, was disarmed by law-enforcement officers. The St. Petersburg news website, Fontanka, reported that this bomb was discovered before the blast in the train car, and it had been left in an unattended bag and consisted of two TNT bricks weighing about one pound each that were hidden inside a fire extinguisher. One of the first theories that emerged on April 3 was the supposition that both bombs - at Ploshchad Vosstaniya and in the train - were left by a bearded man dressed in dark clothes who then quickly left the train car. Several hours after the terrorist attack, his photo was circulated by the media. By evening this theory fell apart: the man on the photograph saw himself on the news, went to the police and declared he hadn't done anything wrong. Later the news website, RBC, citing the St. Petersburg police, reported that the man wasn't involved in the terrorist attack. Then Interfax news agency, citing law-enforcement officers, said the blast was the result of a suicide bomber who was a student from Kazakhstan by the name of Maxim Aryshev. This information, however, has not been confirmed. According to other information, the attack was carried out by a Kyrgyz native who holds Russian citizenship, reported TASS, citing a spokesman of the State Committee of National Security (SCNS). The Kyrgyzstan embassy neither confirmed nor denied this report. Russia's Investigative Committee (RIC) says it established the identity of the alleged suicide bomber but has not yet made his name public. Kyrgyzstan's SCNS named the suspect as Akbarzhon Dzhalilov, born in 1995, and Gazeta.ru published his photo from social networks. According to Kommersant, he may have been identified by his head, which was the only part of the bomber's body intact after the blast. According to media reports, the investigation is checking the possible involvement of Islamist organizations banned in Russia, such as the Islamic State (ISIS). Kommersant, citing "a trustworthy source," said the security services knew that a terrorist attack was being planned in St. Petersburg because they had been "tracking" a Russian national who collaborated with ISIS and who had been detained upon his return from Syria. By wiretapping his phone, law-enforcement agents determined the telephone numbers of terrorists linked to ISIS who allegedly organized the attack, but the agents didn't have enough time to detain them and prevent the attack. Anyway, Kommersant reported that law-enforcement agents managed to block the "clandestine group's" lines of communication immediately following the attack, which helped prevent more casualties. This information is still preliminary, however. It's not known whether Kyrgyzstan native Akbarzhon Dzhalilov was linked to ISIS, and Govorit Moskva radio station contacted a man who worked with him in a sushi bar in St. Petersburg. He said that when they worked together in 2013 Dzhalilov didn't show signs of being religious and "didn't even pray." The situation in St. Petersburg remains tense, and despite the fact that the metro, which was completely shut down on April 3, has resumed operations, some stations are periodically closed when unattended objects are discovered or due to telephone calls that threaten more attacks. The St. Petersburg Metro's press office said that, "thorough inspections of stations and tunnels" continue. Also, following a report about a suspicious object, one of the departments at St. Petersburg State University was evacuated. Additional security measures are in effect not just in St. Petersburg, but also in Moscow where deputy mayor Maxim Liksutov said police patrols have increased, more spot checks are being carried out and police use dogs to sniff out possible explosives. The measures that ordinary people can see are only the "tip of the iceberg," said Sergei Goncharov, president of the Association of Veterans of the Alfa Anti-Terror Unit. "Of key importance now is the covert intelligence work done by security services in order to uncover the terrorists' accomplices and prevent more attacks," said Goncharov. Kirill Yankov, chairman of the non-governmental organization, Passenger Union, holds a similar view, and in an interview with Kommersant he explained that no matter how much one increases the number of police in the metro, it's not possible to check everyone. "Of far greater effect is the work that we cannot see - covert intelligence operations, work in social networks, and etc.," said Yankov. When asked for how long increased security measures will continue, Goncharov said that essentially they should always be in effect. "At a time when a war has been declared by extremists against us and the whole civilized world, it would be wrong to say that we can relax in a few days or weeks," Yankov said. "We should always be on our guard."